There are a lot of World of Warcraft scams out there, so you'd better be educated if you love MMOs. Even lesser-known MMOs have issues with scammers, so it's no surprise that legions of unsavory characters have latched onto one of the biggest: World of Warcraft. If you're a World of Warcraft player and aren't yet aware of the illegalities that occur in your surroundings while you're hacking away at Murlocs, Sitejabber has developed an easy-to-read infographic that covers most of them. 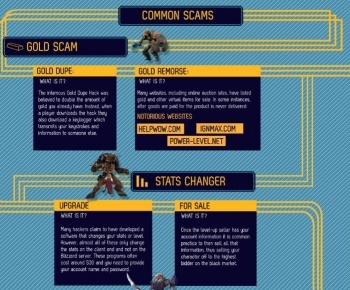 In addition to exposing the dirty secrets of World of Warcraft scammers, the image is also full of fun facts. For example, did you know that the most expensive World of Warcraft account ever sold (illegally) apparently went for $9,900? That's a lot of Deadmine runs. On to the scams, a very common one involves gold sales. While gold farming brings in hundreds of millions of dollars per year, that doesn't mean every gold-seller is legitimate. One of the simplest scams offers to sell players gold in World of Warcraft, but doesn't deliver. A player will get nowhere reporting the crime to Blizzard, because that would mean he/she was breaking the game's terms of service by buying gold. The law might not be too helpful in this case either. Don't ever fall for any website that asks you to pay to download something to improve a World of Warcraft character either, because those sorts of programs don't really exist. In the majority of cases, you'll simply be paying to lose your account. The graphic points out that a "Gold Dupe" hack was popular at one time, which was really just a keylogger. Another similar program claims to improve character statistics and level, but it simply allows a scammer to steal account information, and it's the same deal with "power leveling" services that always require you to give over your username and password. The most common scam that everybody encounters, even those that might never have played a videogame in their life, involves fake emails. These emails will often attempt to look as real as possible and say that the recipient has been invited to a beta test, has won an in-game prize, or that an account update is needed. When a user clicks on the link in the email, it takes him/her to a URL very similar to Blizzard's, but is really a scammer's. Though the infographic includes the names of websites it says it trusts, I adamantly do not recommend ever using any kind of external service to improve your World of Warcraft character. The only safe way to level up or acquire gold is legitimately, and when it comes down to it neither of those things is all that hard. The rules of thumb are to never click on anything in an email, never download anything you're unsure of to your computer, and to never, ever, ever give your account information to anyone, even if they claim to be the president of Blizzard. You're never going to get Deathwing-scale plated armor without journeying into his... fissure, or whatever, okay?